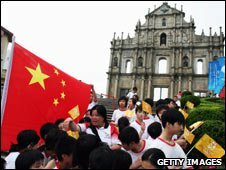 Legislative elections in Macau attracted a higher turnout than usual and strengthened the democratic minority, early results have shown. The tiny gambling hub, ruled by China, can choose only 12 out of 29 seats. Election officials have said a large number of apparently spoiled ballots had been cast, and were delaying the announcement of final results. Concern has been rising about the extent of corruption among officials overseeing Macau's huge casino boom. Initial results published on Monday showed Macau's pro-democracy camp winning three of the 12 directly elected seats - one more than in the previous poll. Some analysts said that this increase, though marginal, symbolised a popular desire for more say in public affairs, especially when the 60% turnout was taken into account. "We hope [Beijing] will now pave the road for [full] democracy," Antonio Ng, a democratic lawmaker, told reporters as he celebrated his re-election. He said results showed that one in five people in the China-ruled territory had voted for democratic candidates. The grandfather of Macau's casino, transport and investment worlds, Stanley Ho, is ailing and observers have started wondering about succession at his far-reaching businesses. His fourth wife, Angela Leong, is spearheading several enterprises and was seen by analysts as keen to secure legislative approval of new projects. She won one of the 12 seats in the legislature. The other 17 seats are filled by appointees chosen by special interest groups or by Macau's incoming leader, Chief Executive Fernando Chui. He was chosen in a controlled process earlier this year after it was clear that he was Bejing's favoured candidate. Mr Chui is a scion of one of Macau's elite families, as his predecessor was, in a territory known for its tight links between government and business. He will formally succeed Edmund Ho in December, as the second chief executive since Macau's return to Chinese rule.